At almost every workshop I lead on implementing project-based learning, collaboration is a major topic of concern. Based on their previous experience working in and using collaborative projects in their classrooms, everyone wants to learn how to get students to work together successfully. Many, if not most, students don't really like working in teams either. It isn't easy to get group consensus, or even persuade others to move forward with your ideas. Inevitably someone does all the work and someone doesn't do any. 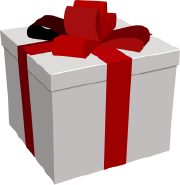 But working in teams needs to be seen as a gift. This precious resource allows you to overcome the things you aren't good it. It is an oppportunity to learn something new, to meet someone new. It is a chance to play and have fun during the process, even if the project or problem you are tackling isn't fun. Teaching collaboration is like teaching anything else - as much an art as a science. There is no easy solution, but a variety of strategies you can employ to help learners with a variety of skills and styles learn to utilize the strength of a team to reach their goals. Remember that your job isn't to make it easy to work in a team, or even to solve a teams problems. When a student comes up and complains that someone isn't doing their share of the work, your response should be, "What do you think the rest of your team can do to change that?" The idea isn't just about transferring responsibility to your students, but making them partners in the educational process. Working with your students to establish norms for group work is a great way to start, before you even begin worrying about composing the perfect teams or choosing just the right set of roles. Begin by talking with your students and working together to discuss behaviors they need for successful group work and will use to guide how they work in groups or teams. Working with a team to complete a project is not very different than working with yourself. You just have to do the same things with other people. Here are some things to remember to help make your teamwork a success. Make sure everyone participates in developing the team’s goal and the work the team will do to get there. Is everyone on the team ready to go the extra mile? If not, you might want to reevaluate the goal and the work you plan to do to reach it. As you set the goals and begin working, make sure the goals are VERY clear. Make sure to stop every once in a while to evaluate whether the work you are doing will help you meet your goals. Make sure you communicate information, ideas, and achievements with everyone on the team. Remember to ask questions if you don’t understand something and to help others when you do understand. Share what you are doing. You do not want team members to struggle to find information you already have, repeat work someone else has done, or misunderstand a concept important to your work. Speak clearly and directly, and get to the point. Listen to what every team member is saying. Ask team members to share their ideas. Encourage everyone to contribute. Remember to stop often and take a critical look at the work your team is doing. Conflicting ideas can help your team determine the best course of action and encourages new ideas. Critiques are directed towards work, not people, so be sure to be friendly, relaxed, and open. Be sure to push yourself to explore new ideas and strategies. You will be the most open to new ideas if you are working in areas you are not comfortable. Be supportive of work and ideas from every team member. Since great ideas come from unlikely places be sure to encourage other team members when they take risks or try something new. Creativity comes from unexpected places. Let a new idea take you in a non-standard direction; you may find that is makes your work more effective. When the team does good work, celebrate. Take pride in the great work you are doing. Success for one is success for all. The list can go on and on. This is a great discussion to have as a school faculty as well. If you are implementing project work across a number of grade levels, look at the list above and have a discussion about which areas you might want to focus on at each grade. Establishing norms isn't simply providing a set of rules. Bring up goals important to you, the manager of the classroom, just make sure your students integral to the discussion and norm creation. This will help make them part of your classroom learning team and is essential to the beginning of a successful project. 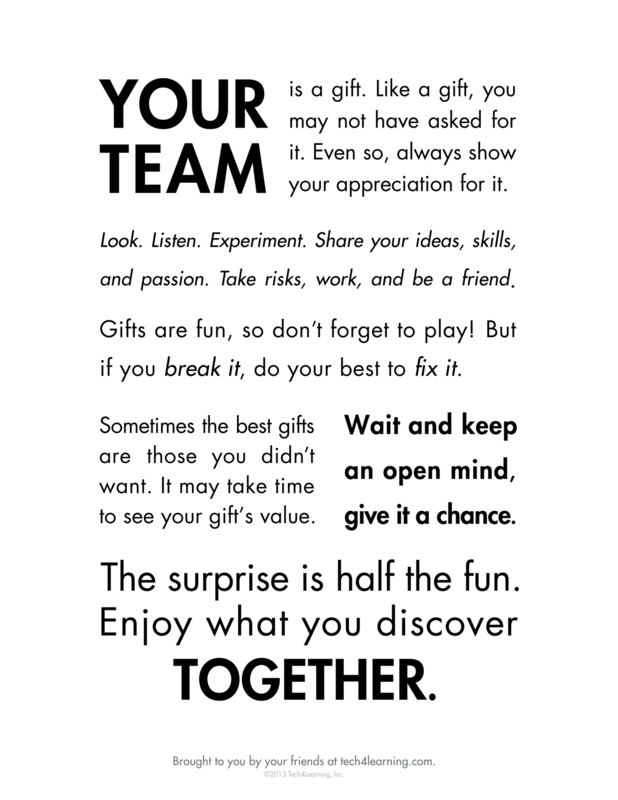 Download a PDF of Your Team is a Gift as our contribution to your team.